One of my all time favorite sandwiches, is this slimmed down version of a grilled Reuben sandwich. 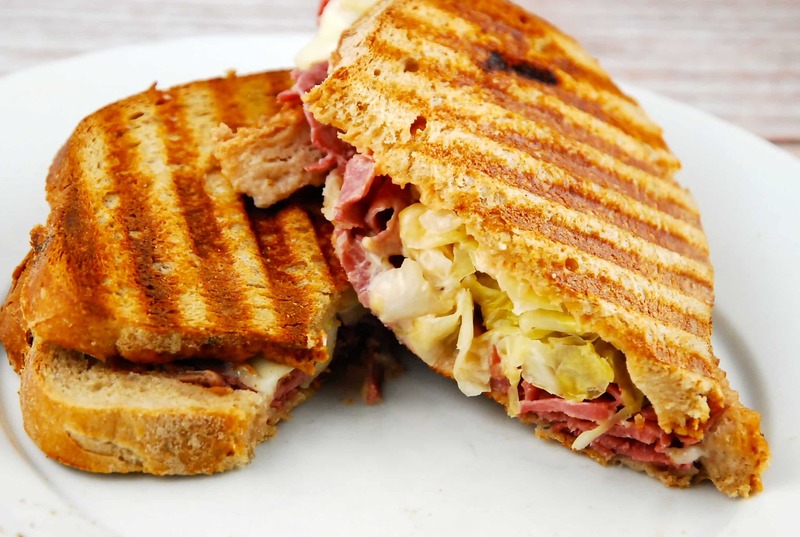 Just by using high quality, but lower fat/calorie ingredients, I was able to transform a traditional Grilled Reuben Sandwich into one that’s very Weight Watchers friendly at just 8 Smart Points for the whole sandwich. All the beloved flavors are in there – melty Swiss cheese, earthy rye bread, salty corned beef, tangy sauerkraut, and creamy Thousand Island dressing – but it’s waaaaaaay fewer Points than a restaurant version. I cooked mine in a panini press (hence the grill marks), which is fantastic to use if you have one, but the instructions are for pan grilling. If you want a hot, melty sandwich that won’t blow your Points budget, this is it. Enjoy! A hearty sandwich full of flavor and low in Points. This slimmed down version has a fraction of the fat and calories of a traditional taste, but all the flavor and then some! Spread dressing on both slices of bread; set aside. Mist a large nonstick pan with cooking spray and set over medium-high heat. Add corned beef to pan and warm through, about 1 1/2 minutes. Move meat to one side of pan; add sauerkraut to pan and stir it until heated through, about 2 minutes. Remove pan from heat and transfer corned beef and sauerkraut to a plate; cover and set aside. Lightly mist same pan with cooking spray and place over medium heat. Place 1 slice of bread, dressing side up, in pan; top bread with corned beef and then layer with sauerkraut and cheese. Carefully place remaining slice of bread, dressing side down, on top; gently press down with a spatula for about 2 minutes. Flip sandwich and heat for 2 minutes more; remove from heat promptly. I am having the same problem with printing. I get the picture but not the recipe. Just wanted to let you know that when I tried to use your print friendly app, all that I was able to get was the upper portion of the page, not the recipe. It really looks good though and I would like to print the recipe off .